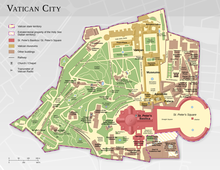 Vatican City ( i/ˈvætɨkən ˈsɪti/), officially Vatican City State (Italian: Stato della Città del Vaticano;[d] pronounced [ˈstaːto della t͡ʃitˈta (d)del vatiˈkaːno]) is a walled enclave within the city of Rome. With an area of approximately 44 hectares (110 acres), and a population of 842, it is the smallest internationally recognized independent state in the world by both area and population. Italy made no attempt to interfere with the Holy See within the Vatican walls. However, they confiscated church property in many places. In 1871, the Palazzo Quirinale, the Papal palace since 1583, was confiscated by the king of Italy and became the royal palace. Thereafter the popes resided undisturbed within the Vatican walls, and certain papal prerogatives were recognized by the Law of Guarantees, including the right to send and receive ambassadors. But the Popes did not recognise the Italian king's right to rule in Rome, and they refused to leave the Vatican compound until the dispute was resolved in 1929; Pope Pius IX (1846–78), the last ruler of the Papal States, was referred to as a "prisoner in the Vatican". Forced to give up secular power, the popes focused on spiritual issues. The Apostolic Palace ( Palazzo Apostolico), the official residence of the Pope. Here, Benedict XVI is at the window marked by a maroon banner hanging from the windowsill at centre. As the Vatican City is an enclave within Italy, its military defence is provided by the Italian armed forces. Vatican City has no armed forces of its own, although the Swiss Guard is a military corps of the Holy See responsible for the personal security of the Pope, and resident in the state. Soldiers of the Swiss Guard are entitled to hold Vatican City State passports and nationality. Swiss mercenaries were historically recruited by Popes as part of an army for the Papal States, and the Pontifical Swiss Guard was founded by Pope Julius II on 22 January 1506 as the pope's personal bodyguard and continues to fulfill that function. It is listed in the Annuario Pontificio under "Holy See", not under "State of Vatican City". At the end of 2005, the Guard had 134 members. Recruitment is arranged by a special agreement between the Holy See and Switzerland. All recruits must be Catholic, unmarried males with Swiss citizenship who have completed their basic training with the Swiss Army with certificates of good conduct, be between the ages of 19 and 30, and be at least 174 cm (5 ft 9 in) in height. Members are equipped with small arms and the traditional halberd (also called the Swiss voulge), and trained in bodyguarding tactics. 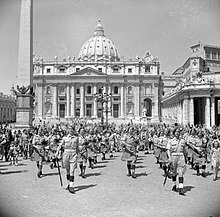 The Palatine Guard and the Noble Guard, the last armed forces of the Vatican City State, were disbanded by Pope Paul VI in 1970. 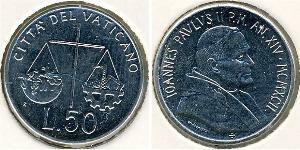 Vatican City issues its own coins. It has used the euro as its currency since 1 January 1999, owing to a special agreement with the European Union (council decision 1999/98/CE). Euro coins and notes were introduced on 1 January 2002—the Vatican does not issue euro banknotes. Issuance of euro-denominated coins is strictly limited by treaty, though somewhat more than usual is allowed in a year in which there is a change in the papacy. 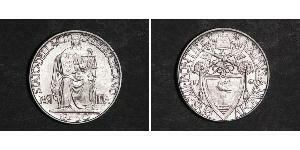 Because of their rarity, Vatican euro coins are highly sought by collectors. 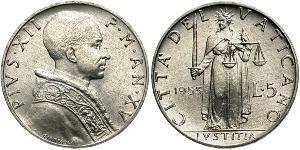 Until the adoption of the Euro, Vatican coinage and stamps were denominated in their own Vatican lira currency, which was on par with the Italian lira. Vatican City has a reasonably well developed transport network considering its size (consisting mostly of a piazza and walkways). As a state that is 1.05 kilometres (0.6 mi) long and 0.85 kilometres (0.5 mi) wide, it has a small transportation system with no airports or highways. The only aviation facility in Vatican City is the Vatican City Heliport. There is a standard gauge railway connected to Italy's network at Rome's Saint Peter's station by an 852-metre-long (932 yd) spur, 300 metres (330 yd) of which is within Vatican territory. The City is served by an independent, modern telephone system, the Vatican Pharmacy, and post office. The postal system was founded on 11 February 1929, and two days later became operational. On 1 August, the state started to release its own postal stamps, under the authority of the Philatelic and Numismatic Office of the Vatican City State. The City's postal service is sometimes recognised as "the best in the world" and mail has been noted to arrive at its destination before the postal service in Rome. ^ Visitors and tourists are not permitted to drive inside the Vatican without specific permission, which is normally granted only to those who have business with some office in the Vatican. ^ Wetterau, Bruce. World history. New York: Henry Holt & co. 1994. 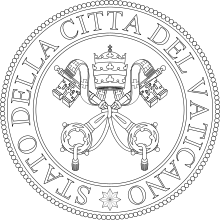 Wikimedia Commons has media related to Vaticano. 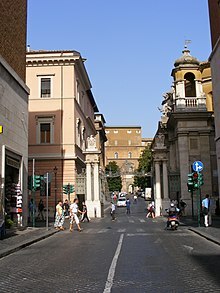 Wikivoyage has a travel guide for The Vatican.